Had enough of your freezing, crashing, slow-running PC? Then, arm yourself with System Suite® PC Tune Up & Repairand get your computer back to peak performance! 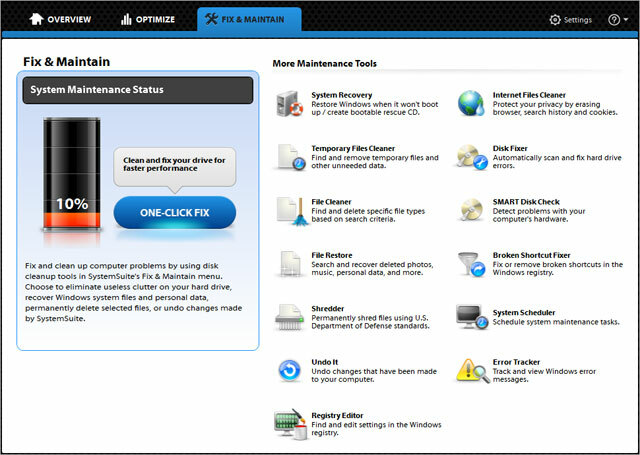 System Suite is THE comprehensive system repair suite that includes everything needed to keep your PC safe, healthy and error-free. It's easy-to-use interface diagnoses and fixes Windows® problems, cleans out hard drive clutter, optimises daily performance and removes viruses and spyware-all from just one window! Includes 1-year subscription to software and tune-up updates. Anti-virus and anti-spyware features are optional and not required during installation.